Story in games is really important but if the writer of Deus Ex: Human Revolution had to choose one or the other, she'd pick game mechanics. Writers are a strange bunch. Most of them have a fairly elevated sense of their own worth (ahem) and will often claim that a piece of art failed in the conception (or writing) stage rather than in execution. Mary DeMarle holds the greatest title for a game writer that I've ever heard - she's the narrative director of the Deus Ex reboot from Eidos Montreal - but she is not your typical "me-first" writer. DeMarle doesn't want to separate the game from the game writing but, if forced, she said that mechanics are more important and must inform the story for a game to succeed. "Obviously as someone who creates stories in games, I think story is very important," said DeMarle. "When I get the question, 'What's more important - gameplay or story?' my answer, surprisingly, is the gameplay. When you're playing a game, the gameplay is creating that story, and the experience that's coming out of it is the gameplay. If we tend to think of them as two separate elements, we're never going to succeed." According to DeMarle, the best games blend the two disparate elements into one cohesive whole. "If [the story] is making use of the gameplay, and recognizing gameplay as one of the elements for conveying the story, then you build a really powerful experience. The story gives you an emotional attachment, a reason to understand your motive, and it allows you to immerse yourself in this thing that's not a part of your life." DeMarle didn't speak specifically of Deus Ex but she said that she is excited about the direction that the industry is moving. "We're developing as an industry and as medium, and as we develop we're starting to really get into understanding how to better tell stories in games." 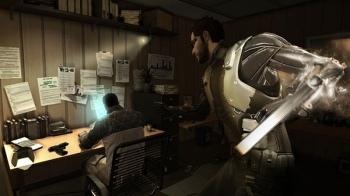 Deus Ex: Human Revolution is due out in March 2011, but now specific date has been set.